As the weather finally starts to get warmer in Europe, thoughts turn to Munich and the upcoming Transport Logistic tradeshow, one of the world’s largest meetings for logistics, mobility, IT, and supply chain management professionals. This year, the show takes place from May 9-12 and will be as lively, crowded and thought-provoking as ever, with a major focus on digital connectivity, data-driven logistics and end-to-end supply chain visibility, leveraging the Internet of Things (IoT). Increasing regulatory demands and continued volume growth in cold chain logistics worldwide is spurring significant development in smart solutions for tracking and monitoring food, pharma and other perishable goods from origin to destination. ORBCOMM will be at the centre of the cold chain debate in Munich – showcasing the latest IoT telematics, web and mobile technologies and explaining how they can help businesses to comply and thrive in a regulated, competitive environment. 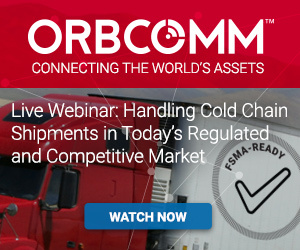 Our on-demand Cold Chain Compliance webinar also delves into the challenges facing shippers, land and ocean carriers and logistics providers. In the European pharmaceutical sector, the EU raised the bar on transport and logistics when it revised the Good Distribution Practice Guidelines (2013/C 343/01) (GDP) in 2013. These guidelines recognised the complex nature of supply chains and laid down new rules for transporting products, especially with regard to verified temperature control. ORBCOMM Europe has worked with companies to help them respond to these guidelines and set up compliant solutions. But it has not just been about compliance and oversight. Thinking about temperature control in a more granular and detailed manner has helped businesses to operate more efficiently, spot opportunities to make savings and even launch new products. For example, we teamed up with transmed Transport GmbH in Germany to see how it could most effectively comply with GDP for last mile distribution of drugs to pharmacies and dispensing doctors. transmed is the logistics and transport arm of the PHOENIX Group, Europe’s leading pharmaceutical wholesaler, supplying up to 140,000 different pharmaceutical items to some 60,000 customers from its network of 153 distribution centers. That’s a lot of products to distribute and monitor. To comply with GDP, transmed had to invest in new refrigerated and air conditioned vehicles and revised operating procedures. We worked with them to develop an integrated system for end-to-end temperature management using our Euroscan MX2 and X3 real-time temperature monitoring and control devices and software interface. ORBCOMM’s temperature recorders provide proof of an uninterrupted cold chain for pharmaceutical logistics and compliance. As pharma shipments move through the full distribution chain the consignments are scanned, identified and matched to the relevant ORBCOMM device. This gave transmed a chance to see the entire cold chain in an integrated manner and grow its business working directly for pharmaceutical producers. The data that our technology provided also enabled the company to go direct to pharmaceutical producers with an offer to fulfil all their GDP delivery needs. A crucial piece of the puzzle for transmed is that ORBCOMM’s Euroscan devices have received the Good Automated Manufacturing Practice (GAMP® 5) official certification of approval from the European Institute for Pharma Logistics (EIPL), something that we covered in a previous blog post. The certification followed a thorough audit from EIPL as well as several pharmaceutical companies. It shows the integrity and reliability of our technology and enables us to give our customers peace of mind that we can help their cold chain comply with GDP from the first mile to the last. At Transport Logistic we will be talking about the connected cold food chain for food and pharmaceutical shipments to, from and across Europe. You can find us at Hall A6, Booth 116. Schedule a Meeting with us or feel free to stop by anytime and find out more about our end-to-end solutions for road, rail and multimodal supply chains.